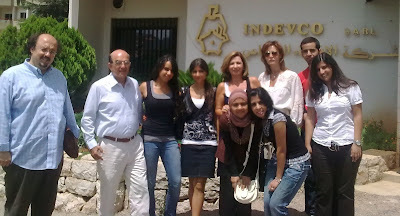 INDEVCO hosts scholarship recipients from across the Middle East region. Students from MEPI Tomorrow's Leaders Scholarship Program visited INDEVCO headquarters to learn about the workings of a multinational manufacturing group. The visit began with a brief introduction of Tomorrow’s Leaders by Dr. Walid Touma of Lebanese American University (LAU). The students from diverse academic specializations originate from across the Arab world. Tomorrow’s Leaders Program is funded by the U.S. State Department Middle East Partnership Initiative (MEPI) and coordinated by LAU Enterprise Office. The program seeks to develop capable and highly-motivated high school graduates in the Middle East as rounded characters ready to take on the challenges facing their countries when they return. The scholarship provides a four-year, university-level scholarship and internship opportunities at select institutions of higher learning in the Middle East. Tony Frem welcomed students and emphasized INDEVCO’s commitment to people and human capital development and growth, as well as to the support of academic institutions in Lebanon. Nicole Jabre presented INDEVCO Group, "The Local Multinational of the Middle East", with comprehensive information about the group's founder, Georges N. Frem, corporate values and mission, history, core business divisions, facts and figures, as well as the Georges N. Frem Foundation. A luncheon followed the meeting.